Our beloved Kito has begun his journey North of the Rainbow Bridge. When Kito first joined MaPaw, he was a frail boy that had given up on life. Once in our care, he blossomed and learned to love life again. In the past couple of weeks, he began having trouble walking and getting up. We tried every treatment offered by the vet to help with his arthritis and discomfort. We thought we were making progress and suddenly he could no longer get up without assistance. When he began to stumble, fall and cry in pain ~ we knew it was time. Surrounded by love and in his foster Mum’s arms, Kito went to sleep and passed peacefully. Kito is twelve years old and is a very sad Siberian who we immediately fell in love with. His human daddy died days before Christmas and Kito was delivered to the shelter. Of course, he is mourning his daddy and has no idea what went wrong. At the shelter, he went into shock and could not eat or drink. 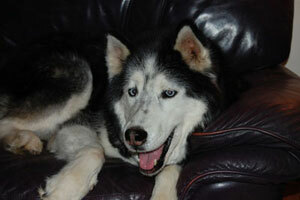 Kito came into our rescue after an emergency phone call from the shelter and this sad Siberian was welcomed by all. Despite the weakness and malnutrition, he greeted us and just laid his tired head in our lap ~ and captured our hearts. Kito is undergoing tests and bloodwork and we are thrilled ~ so far all results are good! He is dehydrated and is being given fluids by the rescue vets. He is expected to go to his foster home in the next day or two for much needed comforting and TLC. Please check back for updates on Kito’s progress – this darling is expected to bloom once again and will be looking for someone to love. Kito has blossomed with love and attention. He has gained much needed weight and has learned to love life again. His favorite pastimes are car rides and hanging out on the couch with his humans. Granted, he can’t quite jump up there on his own yet, but there is always a helping hand ready to help him up for cuddling. He is growing stronger day by day and will even offer a play-bow or two to the other dogs. We are happy to report that Kito’s bloodwork and all tests have come back with wonderful results. We have determined that the “old guy” is deaf, but we just give him plenty of kisses instead of kind words.